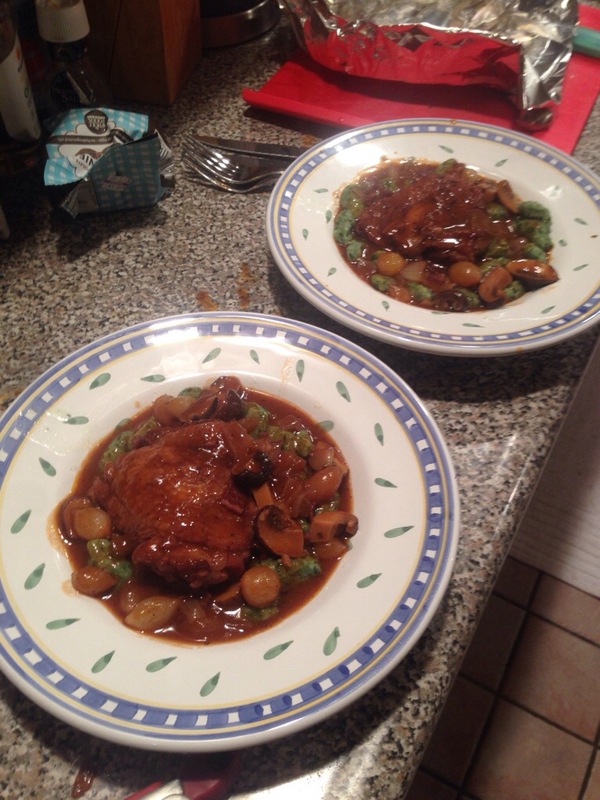 Tonight I made coq au vin (as per usual, it was a mix of recipes). It was AWESOME but now I am so full I can’t move. Ashley also is out of commission. We just sat down and watched a movie after dinner and we are STILL full. 1. In a Dutch oven, cook a lot of bacon. A lot of recipes call for 3-5 oz of bacon, but I made 12 because it’s bacon. Also I cut the bacon into pieces before cooking but I know you don’t like to do that. 2. Take the bacon out and cook chicken thighs (8) skin down in the fat until skin is crispy (about 8 mins). Flip chicken over and cook for about 3 mins just until it’s lightly browned. Do this in batches and make sure you never crowd the chicken. 3. Remove chicken and store with bacon bits. Take out ~2 tablespoons of grease (yum) and store for later. 4. Add chopped onion, chopped stalk of celery, and 4 cloves minced garlic to dutch oven and cook for a few mins. You don’t necessarily have to cook until onions are translucent because they’ll be in the stew for a while. 5. Add 2 cups chicken broth, 2 cups red wine, a few sprigs of thyme, and chicken and bacon bits to dutch oven. Make sure chicken is covered with liquid. Cover almost completely (leave a little bit of space) and cook on low-med heat for 30-45 mins. 6. Take out chicken and add pearl onions and mushrooms (I used cremini mushrooms) and cook for about 15 mins. 7. Add ~3 tablespoons of flour and some of sauce to reserved grease. Add this mixture to stew to thicken. 8. Add chicken back into stew to warm. Serve over egg noodles, mashed potatoes, arborio rice, polenta, or gnocchi. I served it over spinach gnocchi from bricco’s pasta shop and it paired really well. This was so good, took less than two hours, and made a ton of leftovers. You could easily halve the recipe. Just be sure you’re not doing anything active after. Because you won’t be able to. Because you’ll be too full. This entry was posted in weeknight and tagged chicken, chicken thighs, coq au vin, gnocchi, good for a crowd, red wine, stuffed, weeknight. Bookmark the permalink.